Foo Fighters have shared a short documentary for Record Store Day 2015. The film sees the band performing in a record store in Nile, Ohio this April. The venue, independent store Record Connection, is one of the venues that Record Store Day tries to highlight. The shop, owned by Jeff Burke, has been open for 35 years. On the Foo Fighters appearance, Burke said: "What a statement it makes for the Foo Fighters to come and play for you guys." 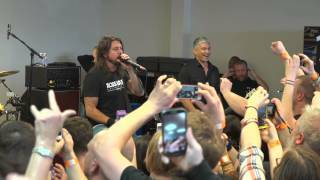 Dave Grohl was ambassador for Record Store Day in 2015. Foo Fighters' latest album, Sonic Highways, was released late last year.